Standard year-in-the-life account. These are all pretty much the same, and McCallum (who would later write about the D'Antoni-era Phoenix Suns) is an old hand at the genre. Here's something you can take to the bank: never again will so many pages be devoted to the "promising careers" of Dee Brown and Brian Shaw. As a Celtics fan, I wanted this to end differently. Lie, Jack, lie! Tell me Larry's back healed, Kevin's ankle held up, and the season that started with so much promise didn't whimper out against the hated Pistons! I guess the good in this season was that it produced MJ's first ring, but reading about this season still hurt, and it reminded me that Bird's career ended far too soon, cut down by a creaky back.Still, it was fun to relive the gradual end of LarryKevinRobert, and remember how great they really were. Also, to learn more about Kleine, Pinckney, Smith, Brown, Shaw, et al. These were the final bright days before some dreary times for the Celtics. McCallum's transcriptions of Bird's accent were kinda fun, too. Still, Jack, you shoulda lied. If you like basketball, you will enjoy this book. If you don't, you won't.In this book, the author follows the Boston Celtics around everywhere during the 1990-1991 season. This was the last good season for the Bird-era Celtics. The book ends with a dud because the season ended with a dud. Hence, the title: the team felt they had unfinished business after a disappointing loss in the second round of the playoffs.This author also wrote 7 Seconds or Less. I think I may have liked 7 Seconds or Less a little bit more than this book. This book is about the last surge of a dying dynasty. 7 Seconds is about a team that everyone wrote off but still nearly made the NBA Finals. If you ever wondered what it was like to play with Larry Bird or Kevin McHale this book will answer your questions. McCallum covers an "aging" Celtics team. Larry Bird is hampered with a chronic bad back. Kevin McHale suffers a number of injuries. This book also provides an insight into the coaching of Chris Ford and how he was able to motivate this team and earn their respect. What is even more interesting than the actual games on the court is the locker room and off court dialogue among the players. This book is enjoyable if you like basketball, particularly if you like the Boston Celtics. But it's also valuable for those who are interested in becoming coaches – – some great insights into building and managing a team – – particularly those with diverse personalities. "Who's gonna f#*& up a wedding cake?" ---Larry Bird (I read this line on a blog and sought out this book. 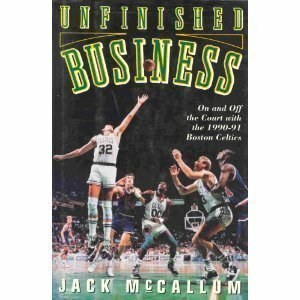 It was worth it)"Unfinished Business" is a great hoops insider book that details a key transitional point in the National Basketball Association, and for its' franchise with the most championships to the day. The aging of the famed Boston Celtics Big 3 tandem (Larry Bird/Kevin McHale/Robert "Chief" Parish) with the occasional sparks of clutch greatness that won Boston 3 championships in the 1980's is given proper attention, and is a perfect counterpoint to the profile on the then up-and-comers in the league at time (Brian Shaw and his contractual battles with his previous time in the international leagues, the Dunk Contest winner Dee Brown, center Dana Barros). McCallum has a fine and intimate perspective on which his writing about the team is built, and he goes into the events of the day outside of the hardwood, such as Brown's racially-motivated incident with the Boston police and the uproar that resulted amongst the minority demographic. Within the game, a dynasty is approaching a nadir that will last for approximately 16 years, in which a similar trade scenario (the acquisition of Minnesota Timberwolves PF Kevin Garnett, and the Seattle Supersonics' Ray Allen in combo with Celtics' superstar Paul Pierce form a new Big 3) would result in a championship. A sad point is to read about the promise and hope embedded in future Celts captain Reggie Lewis, who would sadly succumb to a heart ailment during a playoff series in the following season. A number of these players didn't live up to the expectations heaped upon them as the next wave of superstars, but some (Shaw) would go on to become marvelous role players on other teams. Coach Bill Fitch and his adjustment period to the new coaching gig and the prototypical battles with the Celts head office are mentioned also. A smart writer and one basketball saavy fellow up on the history behind the greatest rivalry in the NBA, Jack gives note to the transitional period of both the Celtics and their archenemies in the Los Angeles Lakers. Keep in mind that this is close to the period when Earvin "Magic" Johnson is about to annouce his retirement due to his contracting the HIV virus. Larry and Magic capture a cross-cultural competitive wonder that riddles their minds even when they can't face off in the case of injury or the like. They made each other (and their teams as a result) better, and propelled the NBA to new heights of fandom with their white knuckle battles that were built on quicksilver playmaking, cutthroat accuracy, willingness of the spirit for taking clutch moments, and above all else, team ball.True to the great team sports books, the psychology of morale building, confidence fluctuation, communion (or lack of it), relations with the coach and support staff have their piece in McCallum's work. More often than not, you learn about the humanity of these players, and the endearing quirks which can endear them to you beyond the amazing things that even the most basically skilled of them can do on the court. The Bird-McHale relationship is shed some light beyond the storied simpatico of their championship glory. You'll see how they contend with aging in a sport where the torch of glory is seemingly taken in the new decade by one Chicago Bulls team powered by a yet-to-peak Michael Jordan and zen master coach Phil Jackson. Larry's feats in spite of his back problems have their luster in print that could have rivaled seeing him live. His maverick attitude, while justified by his killer instinct and production, seems to make sense in co-existence.There's so much detail covered which will provide for many sweet nuggets of information for any Celtics/b-ball fan. By its' end, you'll see a "Changing of the Guard" within the team, the coaching staff, and the organization under which they play. The season is a story setting, and your emotions may run high if you at any time in your life have "bled Green" as some Boston fans will say.If nothing, Larry Bird's wedding cake line and the story behind made it worth the 20 bucks. One of the better journalist follows a team for an entire year books. Though I can only remember bits and pieces of that season it was fun to read about how the Celtics got off to such a promising start with the Big Three and some young additions to the team and how it all played out in the end. Another McCallum masterpieceGreat commentary on an aging team transitioning to a young core of players. It showed the struggle of a team with current times in a league as dynamic as the NBA. McCallum does it again with an entertaining chronicling of a season. Fun for a Celts fan. Interesting but nowhere near as good as The Breaks of the Game. Wonderful book about the 1990-91 Boston Celtics. Full review to come. McCallum shows us once again why he is the premier writer of NBA books.